Custom Box Service is located in farmland outside of Canby, Oregon, which itself is rather rural (though less rural than it once was). About a mile from the office there is a pond. In the late winter and early spring, this pond is home to hundred (thousands?) of geese. For whatever reason, every couple days these geese get into a fit about something and start clucking and squawking. Most of the time they stay back by their pond, and we simply listen to what their complaints. Sometimes, though, they engage in a display of goose fireworks. They rise above the tree-line and take to the sky, flying in great V-shaped platoons. Several platoons cluster together, crossing back-and-forth among each other, individual birds dropping from one V and joining another. The entire battalion of birds swarms through the sky, honking a fearful din, moving slowly to some new destination. Today this army of geese took flight and passed directly over my office. What a noise! I had been preparing to go outside for my walk. But I put off my exercise a bit for fear of the bombs this air force might unleash. I’ve been pooped on before by a goose. It’s not pleasant. I looked out the window just now to see what was making such a ruckus. Here in the country, we often get strange machines roaring and rearing in the nearby fields. In this case, something had been growling for a couple of minutes, but I couldn’t see what it was. “Oh look,” I said to Jeff, who had just come into the office. “That silly chicken is up here foraging for food.” I hadn’t yet fed it its daily chicken-flavored cat food. “I should take a photo with my computer,” I said. But when I went to open the window, a fat juicy yellow jacket dropped from the blinds. This happens often during this time of year. I don’t know where they come from, but yellow jackets spontaneously appear in my office. They especially like to pop out from the light fixture. I have a bee phobia, so when this happens, Jeff knows his duty. He strips the ball cap from his head and thwack thwack he pummels the poor bee into a pulp. “Thanks,” I said. And I leaned out the window to take a couple snaps of my chicken friend. Enjoy! Look carefully. 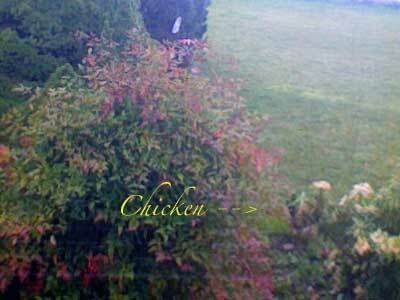 The chicken is in the lower right, between the two bushes. 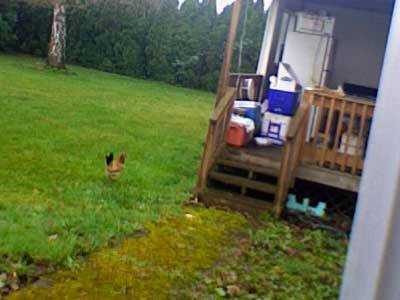 Ours is a free-range chicken. Note the mossy sidewalk. How about a video of the Geese carpet-bombing your headquarters? Chickens are all right (especially cooked in teriyaki sauce) but I prefer stories about the cats. Oh, no cat stories! Chickens are better. And know whats better yet? Stories of your days around your house. Those are the ones I like. The ones where you record what you and Kris did on your weekend and evening. I know those kind of entrys are scorned at by the big bloggers but I happen to like the “I had eggs for breakfast” type entrys! I like the shop talk ones too…and of course the chicken. Yeh, I like the chicken. I feel like I know the old bird personally.